An extension of our residential care program is offered to graduates of House of Hope. 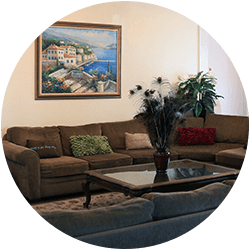 Our sober living facilities embrace the foundation of Structure, Safety, and Love. With this continuum of care, women grow through the reinforcement of skills learned in primary care along with additional support activities provided in this environment. Sober living residents must have a sponsor, be actively working the steps, and also attend regular 12 step meetings. House of Hope provides affordable sober living for its graduates. There are 62 beds between four properties all within a one block radius of the main house. Sober living provides a safe and supportive environment where an individual can transition from the structure of treatment to the paces of everyday life. Women in sober living have access to a computer lab where they are able to perform job searches, submit applications, or complete schoolwork. It is in the early days of sober living that a woman truly begins to identify and take the steps necessary to reach her new goals. All properties are zero tolerance and women are subject to random testing. Women are required to be employed, attend school or volunteer. Women may also be enrolled in our Outpatient program while in sober living. Women will be asked to mentor a new woman, meeting with her for at least one hour per week. It is an opportunity to offer experience, strength, and hope as a graduate of House of Hope. Residents meet twice a month to discuss five (5) specific areas: Financial, Spirituality, Health, Relationships, and Recovery. Women are encouraged to join the alumnae group which meets twice a month. It is a great way to reengage in social events, to learn to interact with others on a committee level, and to bring joy to the primary women through outside activities. The alumnae holds fundraising activities such as the annual Tea, Fashion Show and Silent Auction, an annual fun run, or pancake breakfast. The funds are used to treat the women in primary to an outing such as the movies or a trip to an amusement park. Women are encouraged to do volunteer hours at PV Resale, an upscale resale shop in Lomita. The women gain job experience that may be used on their resume as well as earning credit that can be applied to their rent. PV Resale donates a portion of their proceeds to House of Hope four times a year. We are grateful for the opportunities they afford our women and their financial donation. The Alcoholics Anonymous (AA) 12 step program is the most widely attended self-help program for those who are recovering from alcoholism. In addition, there are 12 step programs for family and friends of addicts which provide support, education and a program to help them heal and forgive others. Family members are strongly encouraged to regularly attend Al-Anon meetings. AA’s 12 step program has been adapted to address other addictions. These programs follow the same 12 step structure and principles for recovery. The 12 Step program’s 12 traditions allows for the creation of a community of people with a common problem looking for a solution. The nature of the program is to provide support, a program of action, and ultimately create a spiritual environment which helps one heal. Anyone can use these steps to live a better life. House of Hope, as part of a local recovery network, can provide immediate access and referrals to an extensive range of recovery and treatment services.